The Devpeteruv Mother of God is a Tenderness image, showing Mother and Child cheek to cheek. Tradition holds this icon to have appeared miraculously on March 13, 1392 (February 29 in the old calendar), but little is known about its early history or the origin of its name. The earliest written record of a Devpeteruv Mother of God places the 12” image in the stone Church of St. Nicholas built in 1666 in Batyushkovo,a village 35 miles from Moscow.In the 1930s, attackers killed the watchman and stole the icon in its jeweled sheath. The image was found in the mud nearby, stripped of ornament. The priest returned the picture to a place of honor in the church. This Icon miraculously appeared in 1392, and was housed in the Church of St. Nicholas the God-pleaser near Moscow. A miraculous copy in Tambov came to be called the Devpeteruvskaya-Tambov Icon of the Mother of God. This Image of the Mother of God was the cell Icon of Holy Hierarch Pitirim of Tambov. After Holy Hierarch Pitirim's blessed repose, the Icon was placed above the reliquary housing his relics in the Holy Transfiguration Cathedral. It gained particular renown in 1833, following the miraculous liberation of a certain person who, on the basis of a false accusation against him, had been imprisoned. St. Pitirim appeared to the man's wife, and directed that a moleben be served before his cell icon. The woman obeyed the Holy Hierarch's order, and soon thereafter, her husband was released from prison. xThis Icon miraculously appeared in 1392, and was housed in the Church of St. Nicholas the God-pleaser near Moscow. A miraculous copy in Tambov came to be called the Devpeteruvskaya-Tambov Icon of the Mother of God. This Image of the Mother of God was the cell Icon of Holy Hierarch Pitirim of Tambov. After Holy Hierarch Pitirim's blessed repose, the Icon was placed above the reliquary housing his relics in the Holy Transfiguration Cathedral. It gained particular renown in 1833, following the miraculous liberation of a certain person who, on the basis of a false accusation against him, had been imprisoned. St. Pitirim appeared to the man's wife, and directed that a moleben be served before his cell icon. The woman obeyed the Holy Hierarch's order, and soon thereafter, her husband was released from prison.This Icon miraculously appeared in 1392, and was housed in the Church of St. Nicholas the God-pleaser near Moscow. 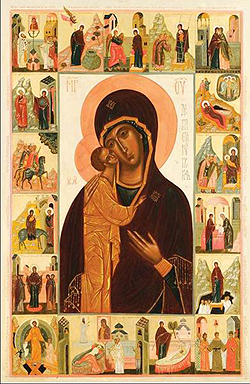 A miraculous copy in Tambov came to be called the Devpeteruvskaya-Tambov Icon of the Mother of God. This Image of the Mother of God was the cell Icon of Holy Hierarch Pitirim of Tambov. After Holy Hierarch Pitirim's blessed repose, the Icon was placed above the reliquary housing his relics in the Holy Transfiguration Cathedral. It gained particular renown in 1833, following the miraculous liberation of a certain person who, on the basis of a false accusation against him, had been imprisoned. St. Pitirim appeared to the man's wife, and directed that a moleben be served before his cell icon. The woman obeyed the Holy Hierarch's order, and soon thereafter, her husband was released from prison.